This basic straight paint is done in a medium shade of gray. The Basic Straight paint from Vintage Chic is definitely the most economical finish we offer without compromising beauty and durability. We use a high quality professional cabinet paint that will hold up to everyday use. With a beautiful satin sheen, you can choose any color you want. 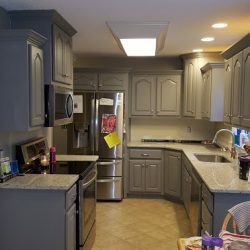 We can offer this option because the onsite part of your paint job can be done by roller (the paint has great leveling properties), so while we spray the doors and drawer fronts it is less intrusive in your home and we do not have to do the complete set up to spray which is very labor intensive. The basic straight paint option still comes with our guarantee. This gorgeous finish will give your cabinets a factory finished look. The multiple coats of lacquer gives a wonderful depth and beauty. This finish can be in any color you would like. This options is all sprayed including the onsite part, so we will set up to spray in your kitchen. Vintage Chic uses a high quality advanced urethane poly lacquer that is a professional cabinet product with low VOC and harmful content, this product is much safer for you and your family than traditional solvent based products. We use professional high end Graco spray equipment to ensure the most beautiful finish for your cabinets. This custom decorative finish option can achieve many looks, whether it is a romantic cottage or farmhouse look, there are many ways we can use this finish to give you a distinct look for your cabinets. Most often this finish is used for a painted and distressed look with a clear coat over the finish. Adding multiple layers is the way we achieve various decorative looks. With the three layer option, this is used most often when a glaze is added over the paint to give the soft, timeless aged look. This finish can be distressed to add even more depth but can also just be with the glaze. A top coat is added over the glaze for protection and durability. The more layers you add, the more you can do with the finish, typically when we get into multi layers like a 4 layer finish it is because the client wants to see multiple colors and textures coming through, while we have done many of these on cabinets, and especially islands, these finishes are usually done on furniture pieces. 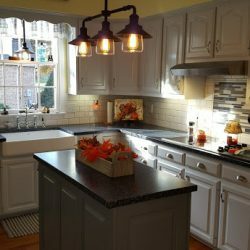 Kitchen cabinet jobs from Vintage Chic typically take about two weeks from start to finish, from the time we disassemble your kitchen until the day we are putting it all back together. However we are only in your home about 5-6 of these days. You can see examples of these options at our studio showroom in downtown Johnson City at 208 North Boone Street. These are a few descriptions of finish options from Vintage Chic Painting, you can see more at the showroom. Hardware hole fill– If you want knobs or pulls in a different place after your cabinets are painted we can make the old holes go away.